If you had 2-3 days in Dubai, what could you do? As it turns out, there’s quite a lot to do in this desert oasis. Dubai is a dynamic city that offers something to visitors of all walks of life. Whether you’re an adventurer seeking new thrills, a lover of culture, cuisine, and art, or a beach bum looking for some much deserved rest and relaxation, you’ll find something in Dubai. So whatever your preferences and passions, 2-3 days in Dubai is more than enough to satisfy your appetites. 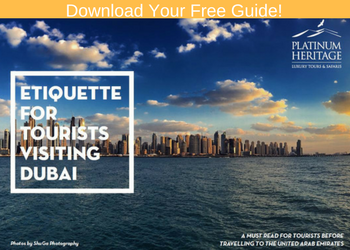 Read on for a newcomer’s guide to Dubai, hitting all the must-see destinations and experiences. …at Dubai International Airport. Take a deep breath, then head to your hotel. Thankfully, because of Dubai’s central location (4 hours from Australia’s West Coast, East Asia, and Europe, as well as 8 hours from the United States), jet lag isn’t too daunting for most travelers. Wash up and get ready for your adventure. Your first stop is Dubai Mall, which is so much more than just a “mall”. It’s a massive retail, entertainment, and lifestyle complex that contains about 1,200 shops, restaurants, and other activities (such as an aquarium and ice-skating rink). Overall, it’s 1.2 million square meters – the largest in the world by total area. Because of its sheer size, comfort, and diversity, Dubai Mall has something for everyone – and it’s not to be missed. A short (air-conditioned) walk away from Dubai Mall lies the Burj Khalifa, Dubai’s crown jewel. At 828 meters, the Burj Khalifa is another one of Dubai’s superlatives: the world’s tallest building. If you have time, buy tickets for At the Top, the Burj’s observation decks. At this height, all of Dubai spreads before you, the frenzied urban activity, endless desert sands, and of course, turquoise waters of the Persian Gulf. In the afternoon, make your way to the Dubai Fountain. Just steps from the Burj Khalifa and Dubai Mall, its showings are every 30 minutes from 6-11 pm and on Fridays at 1pm, 1:30pm, and 2pm. The Fountain’s launches towering jets of water synchronised with lights and music 140 meters into the air. By now, it should come as no surprise that the Fountain is the largest of its kind in the world. Catch the metro a few stops over to the Mall of the Emirates for a quick session at Ski Dubai. As the first (and so far, only) ski resort of its kind in the Middle East, Ski Dubai’s indoor slopes are as close as you can get to the real deal, complete with ski lifts, jacketed skiers, and even penguins. With five slopes that range in difficulty from bunny to black diamond (once again, the first such indoor slope), any skill level can enjoy the desert ski park. Afterwards, return to your hotel. If you want to eat a light dinner and go to bed, rest is always important. However, Dubai’s nightlife is legendary, not just in the Middle East, but across the world for its international appeal and variety. Whatever the case, be ready for tomorrow. No visit to Dubai is complete without sampling the city’s outdoor offerings. It may be a futuristic wonderland, but it also has plenty to offer those who love sand, sea, and sky. Winter is high season, offering the ideal temperature for beach-goers and most travelers. During this time, Jumeirah sees an eclectic mix of water sport aficionados, tanners, families, and friends. Your first stop? The beach, but with a Dubai twist. The Palm Islands are a series of artificial islands constructed with sand reclaimed from the ocean floor. Today, the Palm Jumeirah is a happening locale in the Persian Gulf, with pristine beaches and gardens and iconic hotels, including the Atlantis to the Waldorf Astoria. A short distance away is the Burj Al-Arab, located on a small, man-made island near the upscale Souk Madinat. The Burj was modeled after the triangular sails of the dhow, a traditional sailing vessel that carried silk and spices across the region. As the world’s first seven-star hotel, the Burj’s luxury and stunning views make it a must see. Stay for the afternoon tea at the Skyview Bar and experience the Dubai variation on the time-honored tradition. The best way to explore Dubai’s iconic coastline and get up close to famous landmarks like Burj Al Arab and Atlantis, the Palm is from the sea. HERO OdySEA runs several tours daily leaving from Fishing Harbour 2 in Umm Suqeim. Discover what it’s like to Captain your own boat on Dubai’s only self-drive boat tour! No trip to Dubai is complete without a Desert Safari. 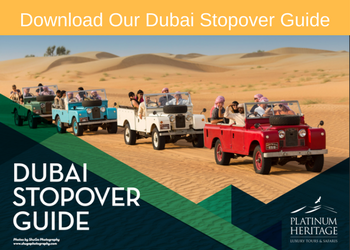 A great reminder of a slower way of life, take a ride on Platinum Heritage’s restored, 1950’s Land Rovers and head outside of Dubai’s urban expanse. You can cruise through conservation reserves home to endangered species (like the Arabian oryx or sand fox) or tuck into a delectable dinner. Along the way, experience cultural performances, astronomy, and falconry while you get a taste of how life once was. If you have a little more time on their hands, try an Overnight Desert Safari with a traditional Bedouin breakfast. Take in the rich Gulf culture, from henna and music to bread making and dance. Stay up long into the night, chatting with friends and loved ones under the boundless sky. If you’re feeling in the mood for culture and history, choose the authentic Bedouin Breakfast. Sip on fresh coffee and enjoy an authentic Emirati breakfast, while a local Bedouin regales you with tales of life amidst the harsh desert sands. Looking for a more scenic morning? Squeeze in one last, unforgettable activity before your flight by choosing a hot-air balloon experience. True to Dubai’s cultural heritage, you can choose to fly with falcons who will circle the balloon (if you’re so inclined). Nothing trumps watching the sun inching up over the Hajar Mountains, and seeing the camels, gazelles, and antelopes moving along the desert sands below.